The Aston Starlight is the first ever laser targeting pencil microphone, allowing for recall of mic position in studio use, and incredibly quick and easy set up in live applications. 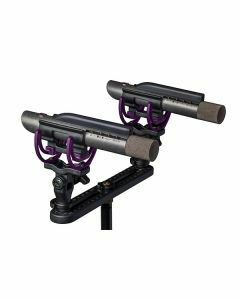 This truly astonishing microphone also showcases Aston’s unique variable voice switching for sound contouring, a nearly indestructible build quality, Aston's signature sintered head, and now famous, tumbled 100% stainless steel chassis. The Starlight features a 20mm cardioid capsule hand-picked by a panel of more than 50 top producers in double blind listening tests conducted during 2016. The Stereo Pair comes with full suspension kit including Rycote shock mounts, mounting bar, windscreens and mic clips. Sintering is not new to the mic world, though seldom used… but Aston have taken the technology a step or 2 further than ever before. They tested many thicknesses of sintered head, as well as the average size of the sinter spheres, and combined that with nickel plate which is controlled to only a few nanometres thickness to achieve near perfect acoustic porosity. In addition the head is virtually indestructible, so like all Aston mics, it can take any amount of studio or even live use and will never let you down. Yet another remarkable step-up in technology, performance and cool features! The Starlight has 3 modes of operation, courtesy of some very fancy front-end filtering between the capsule and PCB. You can chose between Vintage, Modern and Hybrid settings to get the perfect tone response for your application… guitar cab, drums, strings, even vocals… whatever the application you’ll get a perfect fit for your music, and each setting has been carefully tuned to give superb top-flight performance, way beyond Starlight’s price point. Now deeply rooted as part of Aston’s beautiful engineered looks, and rugged un-killable performance, Starlight utilises a 1.5mm solid stainless steel chassis, tumbled for up to 4 hours to achieve their signature finish. Beauty, and a beast! The Aston team have put their hearts and minds into creating the most beautiful performance pieces possible with each Aston product. When it comes to packaging they believe simplicity is king. Protective, re-useable, environmentally sensible packaging that doesn’t cost the earth.